Wrigley, a golden retriever puppy, was unveiled as the “Doggone it” contest winner and Peoples Gas’ new canine safety ambassador to help spread the word about safe digging. National 811 Day is observed each year on August 11th to raise awareness about calling 8-1-1 at least 48 hours before beginning any digging projects. Activities such as landscaping, installing a mailbox, and building a deck are among the projects that require a call to 811. 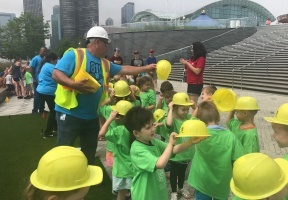 Peoples Gas and 811 Chicago also commemorated national 811 Day with a demonstration of how utilities locate and mark underground natural gas pipelines. 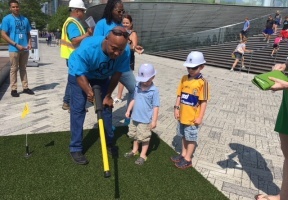 The demonstration, at Navy Pier, served as a reminder to homeowners and others to call 811 for locating and marking underground facilities prior to excavation. 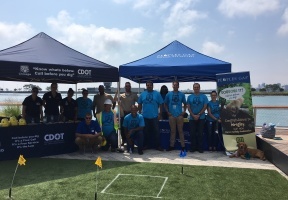 811 Chicago was also present at the celebration to provide information on safety precautions before digging. Visit peoplesgasdelivery.com or 811 Chicago for more information about 811 and safe digging practices.